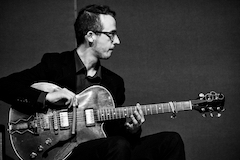 Nicola L. Hein – guitarist, soundartist, philosopher and composer – is a very active player on the german/international scene of improvised music. He plays the guitar with his hands and plectrum but also with a lot of different objects: screws, rulers, iron wool, violin bow, abrasive paper, magnets and many other objects which are part of his musical vocabulary. The result is his very own world of sounds, which is using the rich potential of the guitar as a creator of sounds. The manual creation is a very important character of this sound world, which never gets distorted by the use of electronic effects. He plays in many different formations, including: ROTOZAZA (w/ Rudi Mahall, Adam Pultz Melbye, Christian Lillinger), Lytton/Hein (w/ Paul Lytton), Muche/Hein (w/ Matthias Muche), ZEHN (w/ Philip Zoubek, Etienne Nillesen, Elisabeth Fügemann), The Honey Pump (w/ Mia Zabelka) and many more. Moreover soundart (soundinstallations, site specific instruments, conceptual compositions for improvising musicians etc.) and the collaboration in different interdisciplinary settings (dance, installation, video art etc.) are an important focus of his art and form a second emphasis besides the work as a guitarist. Here different ideas from the world of philosophy (especially Wittgenstein, Rorty, Heidegger etc.) come into play with his musical aesthetics and form a discoursive field that opens up artistic possiblities that lie beyond the possibilities of common musical practise. He has collaborated with musicians like: Evan Parker, Phil Minton, John Russell, Paul Lytton, Frank Gratkwoski, Michael Vorfeld, Max Eastley, Nate Wooley, Miya Masaoka, Thomas Heberer, Rudi Mahall, Christian Lillinger, Tobias Delius, Liz Allbee, Ute Wassermann, John Butcher, Axel Dörner, Thomas Lehn,Tristan Honsinger, Sofia Jernberg, Audrey Chen, Peter Jacquemyn, Alfred Zimmerlin etc. The Oxymothastic Objectar – the guitar as a tool of reflection about the question of a skeptic music, a skeptic form of improvisation. The imagined form of skepsis is one that has to be understood in terms of Gadamer’s dialogue rather than Deleuze’s body without organs, which would resolve music altogether. It is a self inquiring dialog of musical voices, which enjoy the practise of mutual undermining. Skepsis takes on many different forms, sometimes it is hard (with and edge), sometimes it is soft (without edge), sometimes it is sudden etc. The question of a skeptical improvisation has to be understood as a non-concludable endeavour (in order not to contradict itself). Music has to be understood as self-accomplishing skepticism. Dieser Beitrag wurde unter Archiv, Uncategorized abgelegt und mit aktuelle musik, hörbar, nicola hein, stark bewoelkt verschlagwortet. Setze ein Lesezeichen auf den Permalink.